AAHHE | Sylvia Spotlights: Writing, Women, and the Big "What-ifs"
Dr. Loui Olivas, Arizona State Assistant VP for Academic Affairs, says AAHHE helps develop Latino/a faculty and administrators for leadership positions in higher education and serves as an advocacy group to help Hispanics complete graduate & doctoral programs. The 7th annual AAHHE convention was held in Costa Mesa, California, March 7-10. 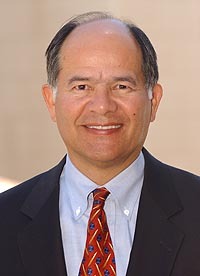 The 2012 theme, “Celebrating Our Similarities, Embracing Our Differences,” reflects AAHHE’s mission: to bring together Hispanic professors, deans, chancellors, presidents, and administrators of higher education institutions with students to celebrate research, dissertations and other accomplishments. Embracing “differences” includes acknowledging the many ethnicities that fall under the “Hispanic” umbrella—Mexican, Puerto Rican, Cuban, Salvadoran, Ecuadorian, and many more. “Similarities include our desire for equal access to higher education, and how Latino scholars produce amazingly fine material once they get there,” explained Dr. Loui Olivas, a business professor at Arizona State University and one of the AAHHE founders. Often times, however, it is a long journey. A Latino pursuing a PhD can be the only person of color in his or her university and can feel isolated. At the convention, however, students are not alone. The convention showcases doctoral research in the annual dissertation competition. Topics run the gamut: microbiology, transborder studies, food science, health, political science, social justice, business, medicine, communication and education—not just Chicano studies. Dozens of workshops featured the latest findings in those areas. Keynote speakers Luis Ubiña, president of the Ford Foundation, and artist-activist Dr. Judith Baca of UCLA, revealed their personal struggles to rise to the top of their games. “My mother who was from Ecuador, bent her back over a sewing machine to get me to a better place,” said Ubiña. He ended up at Harvard. The Foundation, which offers approximately $500 million a year to various worldwide charities that effect social change, will also support AAHHE efforts, he said. Baca explained how her art is a reflection and celebration of the journeys of Latino families and their place in California history. Raised by women in East L.A., her grandmother was a powerful influence. “Women survive in a hostile environment and lead movements,” she said. For attendees whose roots gave them the gumption to seek the proverbial “American Dream,” the speakers’ messages struck a chord. “Judith was the first AAHHE speaker to ever get a standing ovation,” said Olivas. Indeed, the convention seemed like a celebration of all things Latino. Connections were made over café con leche. Attendees slipped from Spanish to English, or Spanglish. In between workshops, there was laughter and heated discussion, art displays and salsa music, kisses and hugs instead of handshakes—all from a robust culture-based energy. “It’s like my family, mi familia,” said Dr. Leticia Oseguera, assistant professor of Education Policy Studies at Penn State. For many, family helped get the Latino scholars to the likes of Harvard and Stanford, Cornell and Georgetown, USC and UCLA. At the AAHHE convention their education continued. They witnessed generations of successful Latino administrators who have been there, done that. They survived and thrived and now make a difference in decision-making positions that reach far beyond the ivory tower of a higher education institution.